As seen in the applications, Tricept technology gets along well with any type of machining. Another application where tricept modules are a good choice is assembly when big forces need to be applied to perform the task. This is the case for assembly of engine parts, as it can be seen in the photos coming along with this page. 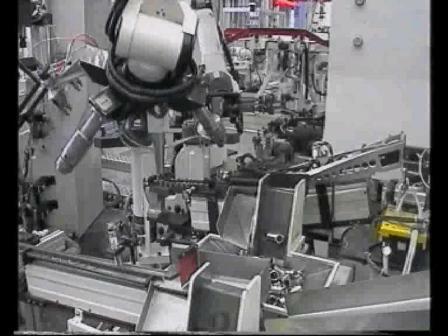 These robots are working in the assembly of components for engine parts: bearing, washers, pins, and so on. In some cases some extra force needs to be exerted in order to complete the task successfully. Thanks to the parallel structrure of the tricept, these forces can be applied without problem with the smaller of the tricept modules, the tricept T60X family. It is also possible to configure the end effector of the tricept to perform the assembly with a revolver heard, as shown in the following application in GM Shangai.